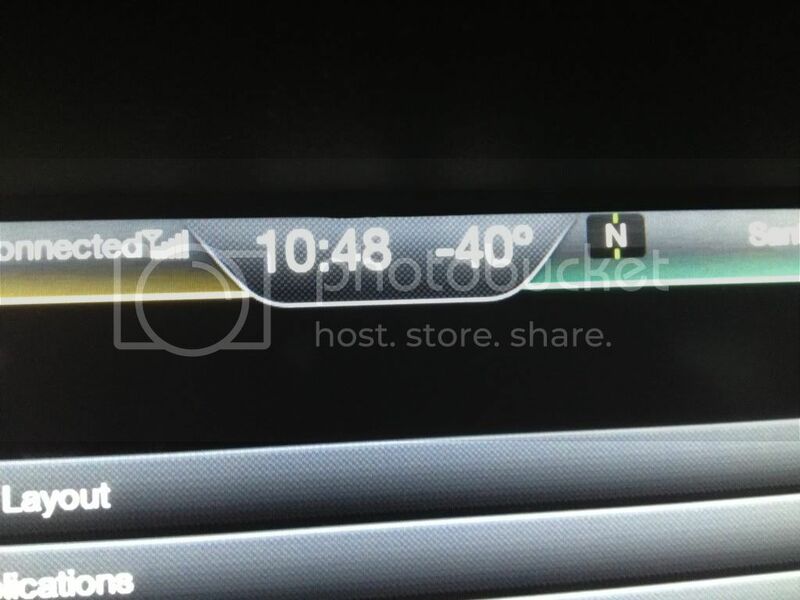 My kitchen thermometer read -5F this morning, but the car dashboard showed 5, then 1, then 0 as I got to work. Do these cars show below-zero temps correctly? I have a 2013, which may matter. I'd guess it's about as accurate as your kitchen thermometer. Which is to say that either could easily be off by 5 degrees and there could easily be 5 degrees of temperature difference in the different locations of the thermometers. My car spends a lot of time in about that temperature range, and I park in an unheated, attached garage. It's normally about 5 degrees warmer in the garage than outside, and if I have been pre-conditioning, the car temp will show a little bit warmer. Within a few blocks of leaving my driveway, my outside temp stabilizes, usually within 1 degree of what is being reported on the radio. I think the temperature sensor is in the passenger side mirror, so If you had some snow build-up around the sensor, it's conceivable that it could be affecting the readings a bit. Really? Aren't they typically behind the grille? Looks like it's behind the grille on my Focus. My C-Max and Escape are both Focus based, no? Thanks, folks! Yes, I had a GO time for this morning, so I'm guessing that it heated up the sensor enough to register 5, which then lowered as I drove. We'll see what it shows later today. Is your car parked in a garage? I know for a fact the NRG outside temp sensor is in a slight dimple on the bottom of the right side mirror. If water gets in there it shorts the sensor, which in turn runs reads out -45 degrees and disables the AC - in fact it will turn on heat instead of cold until the sensor dries out or resets. It resets at 25 MPH, so that may be what you're experiencing when it 'gets right' after you've driven. Ford replaced mine, but the =design still lets water in behind the mirror which puddles in there. You may be experiencing frost melt. Yes, but it's completely uninsulated and quite drafty. The sensor is in the right mirror. My car is in the garage too in general (when I'm home) and when I leave the garage it goes down slowly within 1 mile or so should stabilize to the outside temperate. Last year I went to you do it electronics on President's day and it was -10 F when I left, 17F when I returned home after recharging near you do it that day. Temp gage works perfectly for me, never had an issue with water or washing the car. I am just careful not to rub the sensor when trying the car mirror.